I know that Summer's over, but I'm still enjoying salads. I'm eating a lot of comfort food too. Comforting bowls of soup, stew and chilli, which are great, but sometimes all I want is a salad. 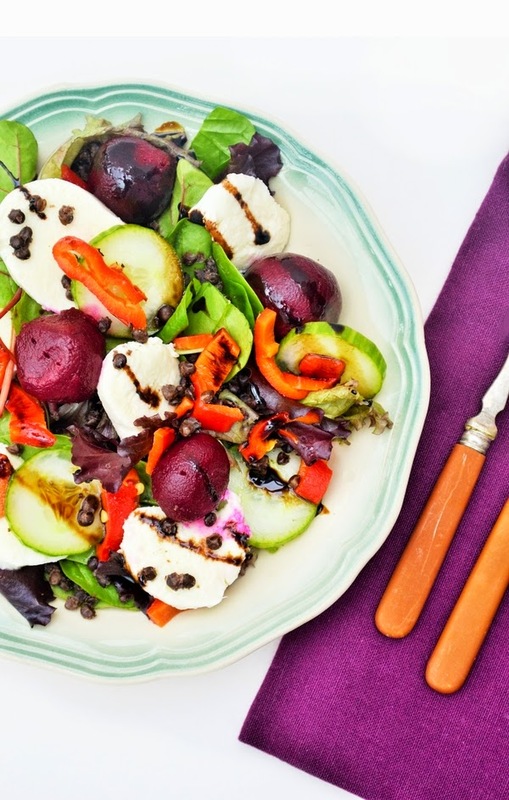 On days when I'm at home and working flat out trying to get all my housework done and catching up online, I want something a bit special for lunch like this puy lentil, beet and mozzarella salad. Some of my friends on Facebook will be laughing at that, as I admitted to having a squeezy Heinz tomato cup-a-soup for lunch yesterday. Hardly inspiring, but wonderfully quick and low in calories. My cup-a-soup may not have been inspiring, but this salad was. A mixture of salad leaves and slices of crunchy cucumber topped with roasted red pepper, tangy pickled baby beets, creamy puy lentils, fresh milky mozzarella topped with a drizzle of balsamic syrup. Just wonderful. For convenience I used jarred red peppers and ready to eat puy lentils. My favourites are Cooks & Co Roasted Red Peppers and Merchant Gourmet Puy Lentils. In my opinion these are store cupboard essentials and are really handy for throwing together a quick meal. Are you still enjoying salads or have you put them aside for more hearty dishes? 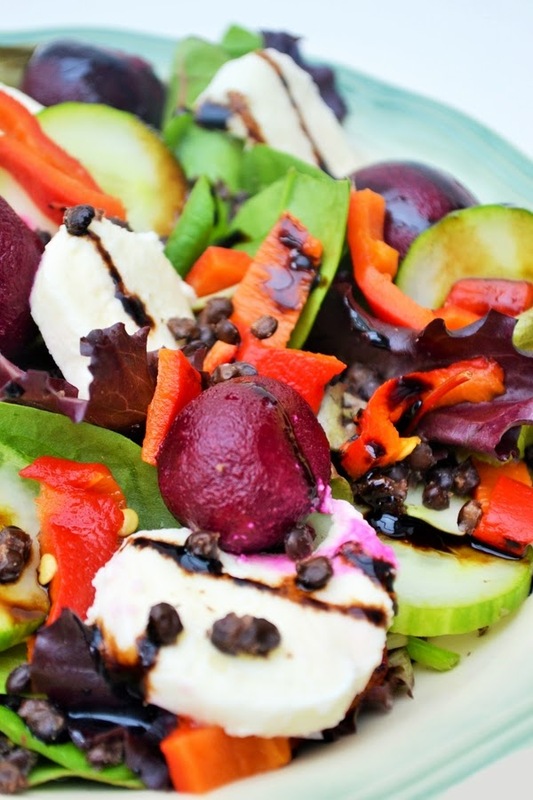 A hearty and colourful salad for a satisfying lunch. 1. Slice the red pepper and mozzarella.2. Layer up your salad in a bowl. First the salad leaves, then the cucumber, mozzarella and pepper. Sprinkle over the lentils, then top baby beets.3. Drizzle with balsamic glaze. 4. Enjoy! Those colors!!!! Gorgeous :) I'm a huge salad lover year-round. Love the addition of lentils here!! Ooh, that salad's beautiful. I don't eat lentils in salad very often - it's a special thing you find when you're out. I don't know why it never occurs to me to do this at home. I'm just about to roasting beets - the last few peeled and put up ones are running out, and then it'll be down to chopping up greens and using them in soups and all the good winter flavors. Do enjoy that last gasp of summer while you can! Ahh well it's gone now really and there's a nip in the air. I haven't roasted beets for such a long time. I never seem to have time to do things like that or preserve these days. So colourful! I love a salad all year round! Will have to buy some beets tomorrow - Ive got a craving now! What a beautifully vibrant salad! Love the flavour combination. I am still eating salads, but I'm trying to make them a bit heartier these days. Comfort food is required for these cold months! Thanks Elizabeth. I'm with you on the heartier salads. Its refreshing to have a salad among all the autumnal recipes. The colours are wonderful. Thanks Rebecca. That's what made it so appealing to eat. Ahh that's a shame you don't like beets. You could always add another veg instead. Such a beautiful salad... So fresh n colorful. SO pretty! Gorgeous colours & I bet it tasted lush. Thanks Janie and yes it did. In the darkest coldest days of winter you would still find me curled up in the corner with a salad or two. I cant resist them. Stumbling and pinning. My heart skipped a beat momentarily - I read beet as beef! Glad to see you're not surviving on cuppa soups alone Jac ;-) Your salad looks delicious and now I'm craving something fresh and tasty. As if Choclette and thanks I was rather pleased with it. This salad is so beautiful, and I love all the flavours in it! It would make a great light lunch.